ePublishing Knowledge BaseePublishing Knowledge BaseePublishing Knowledge Base Creating Image Galleries, Videos, Podcasts, and Downloadable FilesHow do I add a podcast episode to my site? This article will show you how to add a podcast episode file to your site through the use of the Media Manager. If you would like to create a new podcast, and not just an episode, read this: How do I add or create a new podcast on my website? 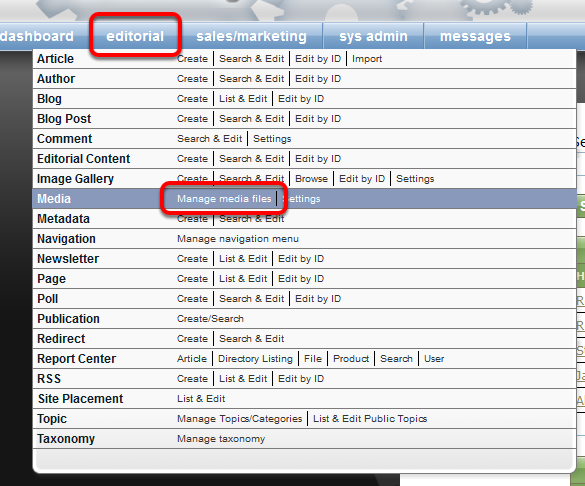 Access the Media Manager under Editorial in your admin dashboard. Click Manage Media Files. By opening up the Media Manager, you will be able to add a podcast you would like visible on your website. Choose the relevant directory / sub-directory. 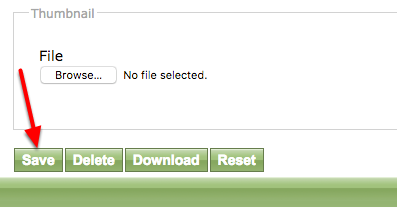 Select New File in the upper righthand corner to add the audio file. Enter the Display Title for the podcast episode. Find the audio file on your system via the Browse button. The file type will automatically flip to the Audio file type. 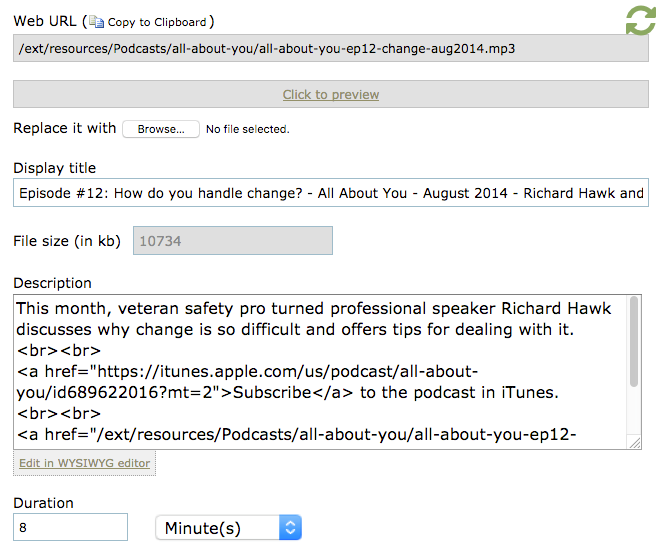 Update the audio file record with relevant podcast episode information. Review or update the following fields with information on your podcast episode for your site visitors. Display title: This is the episode's name. Description: What is in this episode? Provide links, if you wish, for how to find this episode on other outlets, like iTunes, Soundcloud, and/or Stitcher. Tips on using the Wysiwyg: How do I format content? Duration: How long is the episode? If you leave this at zero (0), we will not tell the site visitor. Otherwise, this information can be quite useful to your visitors. Should the podcast be available in search results? If the box next to Indexable is selected, the audio file can appear in relevant search results. Left unchecked, the audio file will not appear in search results. Select the box next to the Topic / Category > Audio Galleries > [podcast name] to associate the episode with the podcast. Tag the audio file with the podcast's taxonomy found under Topic / Categories > Audio Galleries. Select other relevant Topic / Category taxonomies if you'd like the podcast to show up in other places on your website. Choose any and all relevant editorial topics found under you Topic / Category taxonomy. This can be called Topics, Main Topics, Channels or Editorial Topics. Optional: Classification Association to lock content based on a reader's registration status. Otherwise, leaving this off just allows all of your site visitors to listen to your podcast unhindered. iTunes Images: Podcast feeds contain artwork that is a minimum size of 1400 x 1400 pixels and a maximum size of 3000 x 3000 pixels, 72 dpi, in JPEG or PNG format with appropriate file extensions (.jpg, .png), and in the RGB colorspace. To optimize images for mobile devices, Apple recommends compressing your image files. Simply hit Browse under Thumbnail in your audio file to find the image on your computer and upload it. Check with your site's documentation, past uploaded thumbnails for podcasts, or talk to your project manager for the preferred size of the thumbnail. Prev: How can I change the default thumbnail size for image galleries? Next: How do I add or create a new podcast on my website?